You may be wondering, “what exactly is engineered hardwood flooring?” When talking about an engineered product, you may also hear the term “laminate.” There are some common factors amongst each manufacturers engineered products but there are traits that make one stand out more than the other does. Therefore, we recommend to research and understand quality and construction of each. Below we will answer 6 questions about engineered hardwood floors. 1. Is laminate and engineered the same? The construction of laminate and engineered is the same but the materials being used are different. Laminate has multiple layers of composite wood pressed together and topped with a photo image that resembles wood. As for engineered wood flooring, it is made of several layers of plywood that run perpendicular to one another. This is preferably made of Baltic Birch plywood due to its resilience and improved stability to damp environments. 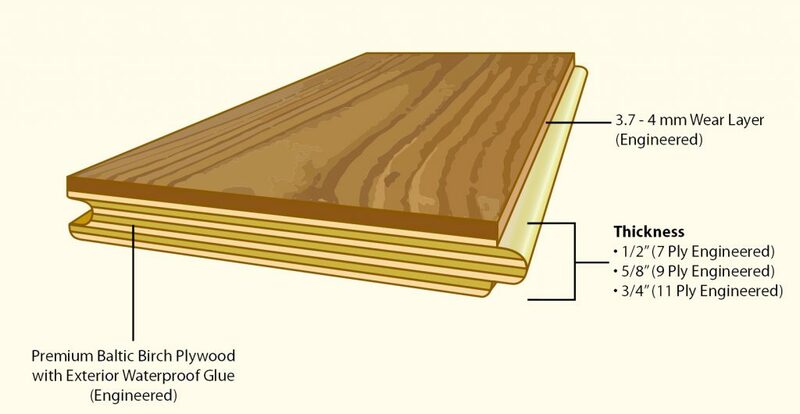 The backing (ply) should be thicker than the wear layer (surface), which is made of real solid hardwood. Engineered hardwood flooring is more structurally stable than solid or laminate. Ideally, 3/4” engineered floors should have 11-ply backing and a 4mm wear layer. This allows the natural beauty of a real hardwood surface to last for many generations. We recommend checking with the supplier for the exact wear layer thickness as not all are manufactured to the same dimension. This can be a concern if needing to refinish the floors from any damage or maintenance down the road. 3. Where can it be installed? Engineered floors are very versatile since they can be installed on, above, or below grade. In addition, they can be nailed down, glued down, or floating depending on the subfloor. Engineered floors are ideal for placing over concrete slabs or other areas unsuitable for solid wood that are susceptible to high moisture, for example, basements. They are also ideal for placing over radiant heat systems due to their stability. Engineered floors typically do come at a cost depending on the widths you are looking for. Sometimes engineered floors can end up being less expensive than solid wood depending upon the dimensions and grade. Also, their stability and tolerance of environmental changes within the home are worth it in the long run. Don’t forget, they also have the same lifespan as solid hardwood floors – timeless beauty. 5. Does it look like solid hardwood? 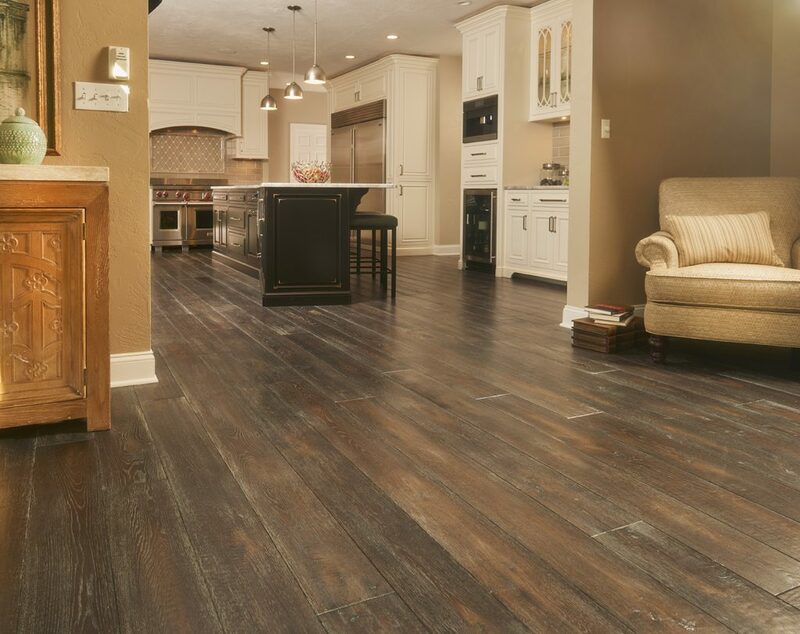 Engineered hardwood floors consists of a natural wood wear layer so you not only can see but also feel the authentic textured details of grain pattern and natural charm. Therefore, once the floor is laid down, you are unable to tell if the floor was actually a solid or an engineered product. 6. Can it be refinished? Depending upon the manufacturer’s wear layer thickness, you may be able to refinish an engineered floor. Thicker wear layers provide the option to sand and refinish as thin wear layers can’t be sanded due to possibly sanding through to reveal the core. Therefore, you may want to check on the manufacturing specs beforehand to see if their engineered product has the capability to be refinished. At Peachey Hardwood Flooring, our wear layer can be refinished up to 3 times, which is the same as our solid hardwood floors. If you have any other questions about engineered floors, please give us a call and one of our hardwood flooring experts would be glad to help.